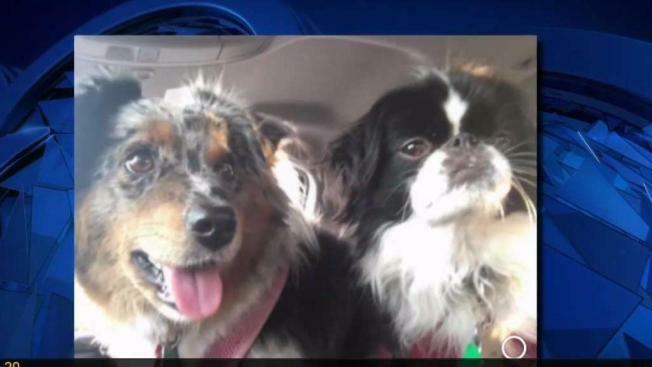 A New Hampshire family credits their small dog with waking them up in time when their house caught on fire. Travis and Joanne Allen are crediting one of their dogs with saving their lives. Early Sunday morning, Travis and his daughters Grace and Madelyn were awakened by their barking dogs to their house engulfed in flames. One dog started barking first, but it wasn't until the usually more quiet dog started barking that Travis woke up. "My Japanese Chin [dog], who kind of like an old man and doesn't really do much actually, woke up flipping out barking, kicked me in the head, and scratching me, which finally got me to wake up," said Travis. The fire started in the barn, which has now been reduced to a black pile of rubble. The fire travelled into the house - and that's when the dog jumped into action. The Allens said they have lived at their home in Bow for about year, with their two dogs, cats, and barn animals until just a day ago. "We just got it to where we had envisioned it in our minds, so it's devastating," Joanne said. Joanne was out of town in Connecticut when the fire happened. She saidher friend drove her back as soon as she heard what happened. By then, the damage from the three alarm fire had already been done, including the loss of several farm animals. "The fire from the barn had actually spread to the front tires, and made it explode," Travis said. "So I ran to the back and ran into smoke at the back of the house." Thanks to the wake up call from Yogi, Travis was able to jump into action quickly. "I just had enough time to wake my daughter upstairs, run downstairs and wake my other one up," Travis said. How's Fire Chief Mitchell Harrington said although the conventional smoke detectors didn't work, the dogs did. "We know smoke detectors save people's lives all the time, alerting people while they're sleeping to get out of the house before conditions prevent them from getting out of the house, but the dogs essentially filled that function," he said. The Allen's do give credit to the Fire Department for their hard work. Harrington said 60 firefighters from several area department helped put out the three alarm fire. Right now the Allen's are staying with extended family and friends. They say that they are ultimately grateful to be alive. "We're just grateful that we have each other," Joanne said. And of course, their canine hero. "They've raised in status in our lives," Joanne said. The cause of the fire is still being investigated, but the Allen family said they'll likely never know what caused the blaze.